From left to right are Jeff Felton, president, Connected Care and Analytics, McKesson Corporation; John F. Duval, CEO, MCV Hospitals, VCU Health System; and Rich Umbdenstock, president and CEO, American Hospital Association. At Virginia Commonwealth University Medical Center, we focus on the safety of our patients, staff and visitors because that’s what matters to us. 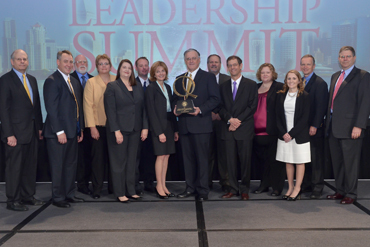 It’s also what makes us winners — our outstanding programs and patient care were recognized with the 2014 American Hospital Association-McKesson Quest for Quality Prize, a distinction awarded to one standout U.S. hospital annually for leadership and innovation in quality improvement and safety. 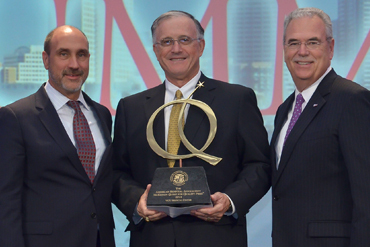 The Quest for Quality prize, AHA’s top quality honor, recognizes our “Safety First, Every Day,” mantra that supports our mission of becoming America’s safest health system. Since beginning this journey to high reliability in 2008, more than 12,000 staff members have been trained in safe behaviors and error-prevention tools, a custom early-warning system was developed to alert providers to potential changes in patient conditions, a chief safety and quality officer was recruited and tasked with taking the medical center to new levels of safety and quality, and a Complex Care Clinic was opened to care for the sickest patients. Accepting the award, from left to right, are Jerome F. Strauss III, M.D., Ph.D., dean, VCU School of Medicine and executive vice president for medical affairs, VCU Health System; Colin A. Banas, M.D., M.S.H.A., chief medical information officer, VCU Health System; Claude "Buddy" Satterwhite, "safety star" and maintenance supervisor, plant operations; Sharon Gibbs, M.S.H.A., CRA, CNMT, director, VCU Department of Radiology; L. Dale Harvey, M.S., R.N., director of performance improvement, VCU Health System; Robert Jarvis III, "safety coach" and evening shift supervisor of diagnostic radiology, VCU Department of Radiology; Deborah Zimmermann, D.N.P., R.N., NEA-BC, chief nursing officer and vice president of patient care services, VCU Health System; John F. Duval, CEO, MCV Hospitals, VCU Health System; Larry Little, vice president of support services, VCU Health System; Sheldon M. Retchin, M.D., M.S.P.H., CEO, VCU Health System and senior vice president, VCU Health Sciences; Jenifer K. Murphy, M.H.A., operations manager, performance improvement; Elizabeth Williams, "safety star and coach," R.N., Acute Care Medicine; Ralph R. Clark, M.D., chief medical officer and vice president for clinical activities, VCU Health System; Eugene N. Peterson, M.D., Ph.D., chief safety and quality officer, VCU Health System and associate dean for patient safety and quality care, VCU School of Medicine. The selection committee was particularly impressed by the medical center’s leadership, team members, accomplishments and progress toward achieving the Institute of Medicine’s six quality aims — safe, effective, efficient, timely, patient-centered and equitable health care. It also lauded VCU Medical Center’s culture of community collaborations to reach out to underserved populations and our focus on addressing health care disparities. What is the Quest for Quality Prize? Why is the prize given? What is the American Hospital Association? AHA is a nonprofit association of health care organizations and individuals committed to the improvement of health in their communities. Its members include nearly 5,000 hospitals, health care systems, networks and care providers as well as 43,000 individual members. AHA provides education for health care leaders and is a source of information on health care issues and trends. Learn what led to our award.